Attorneys have unique needs and financial goals. Champion Wealth Strategies works with you to customize a plan based on the full range of the financial and estate planning issues you are likely to face now and over the course of your lifetime. Business planning is about taking care of those people who have made the business successful through their vision, drive, and commitment. 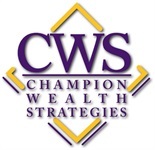 Champion Wealth Strategies can help you create comprehensive personalized business planning strategies, by taking care of owners, key executives and employees. Champion Wealth Strategies can simplify the demands of managing your wealth, enabling you to devote time to your business, your personal endeavors and your family. Brandon Worley is a Registered Representative with and Securities and Advisory Services offered through LPL Financial, a Registered Investment Advisor. Member FINRA & SIPC.